Floyd McClung Guest Speaking at CCF on January 31st! We received an unexpected opportunity for a superb communicator and well known church planter and Christian leader, Floyd McClung to come and minister to us at CCF at the end of this month. He will be flying in from South Africa, doing some consulting with EMM and then joining us on Sunday, January 31st for our Worship Service! Click here to learn more about the McClungs! Click here to learn more about the ministry they lead! 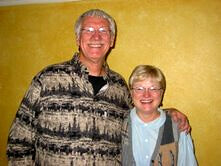 Sally and I have been married for almost forty years and are still best friends. We love Jesus, our kids and our grandkids, non-shedding dogs and a good bowl of ice cream! I love to hunt, hike and experience anything adventurous! Sally loves a quiet day, a good book and browsing in antique stores. We got engaged on an outreach to Jamaica, while standing in a food line with three hundred other noisy students. Not very romantic, but I was in love, we were going to be separated for two months on different teams, and I didn't want to "lose" her to another guy. So I wrote Sally a note while standing there in line. It said, "I love you. Will you marry me" She fell for it! And here we are, almost forty years, two kids, two grandkids, numerous pets, and countless airline miles later, more in love than ever. After living in Kabul, Afghanistan and Amsterdam, Holland for more than 20 years, Sally and I discovered that we are most fruitful in doing three things: making disciples, training leaders, and planting churches. We love serving God. We never cease to be amazed that God uses us. As a "mother and father" in the Lord, we feel we are entering the best years of our lives. Our calling is to help people discover their gifts and passions and utilize them to spread the worship of Jesus where He is least known. We have gone to the hard places of the earth to tell people about Jesus, and now we are called to ask others to do the same. And when they do, we promise not to forget them when they get there! That is why we started All Nations but that is another story!